The Co-operative Bank has closed the bank accounts of more than 25 community groups campaigning for human rights. But the Bank’s Ethical Banking Policy states that “PROMOTING HUMAN RIGHTS AND EQUALITY IS ONE OF THE PILLARS OF OUR ETHICAL VALUES”. How can it have it both ways? The Co-op Bank did not discuss their decision with any of these groups before telling them that their accounts had been closed. They have told these groups that their bank accounts are “too risky”. But no other bank has acted in this way. National PSC has started legal proceedings against the Co-op Bank. You can read their press release here. We say that this behaviour is outrageous, and exposes the Co-op Bank’s Ethical Banking Policy as WINDOW DRESSING. 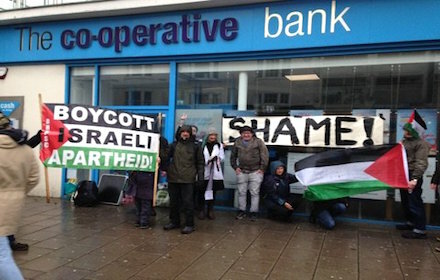 We call on all our members and supporters who have accounts at the Co-op Bank to close their account and – most importantly – to tell the Branch Manager why you have done so, in protest at this overtly political and targeted action.